Hiram Ulysses Grant, mistakenly listed as Ulysses Simpson Grant on United States Military Academy cadet rosters, ascended from Midwestern obscurity to become the Union’s military savior and, later, the 18th President of the United States. U.S. Grant’s requirement for “unconditional surrender” in American Civil War battles and sieges helped define his adopted initials. After President Abraham Lincoln promoted him to lieutenant general, Grant designed the comprehensive strategy that doomed Confederacy and forced Gen. Robert E. Lee’s April 9, 1865, surrender at Appomattox, Virginia. Grant issued generous surrender terms and worked with Lee to decide the fate of this nation, not merely at that hour, but for future generations. 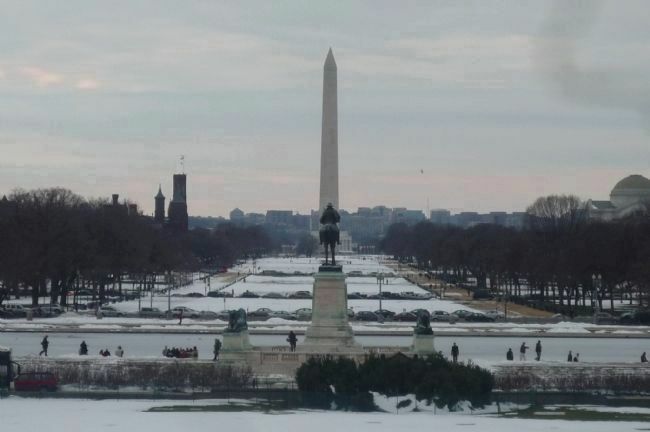 - view toward the Capitol and the General Grant Memorial statue, upper left beyond the Reflecting Pool. Ridge, during the battle for Chattanooga, Tennessee. [ Photo caption:] Ulysses S. Grant, 1822-1885. Civil War General Grant confidently gazes westward toward the nation’s heartland–and the memorial to his great benefactor, Abraham Lincoln. 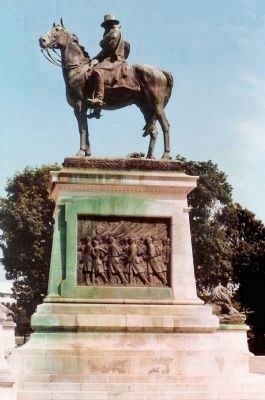 The Ulysses S. Grant Memorial captures the General’s cool, military bearing while in command astride his favorite warhorse, Cincinnati. Around him swirl the chaos and confusion of the battlefield exhibited by the memorial’s onrushing cavalry and artillery groups. 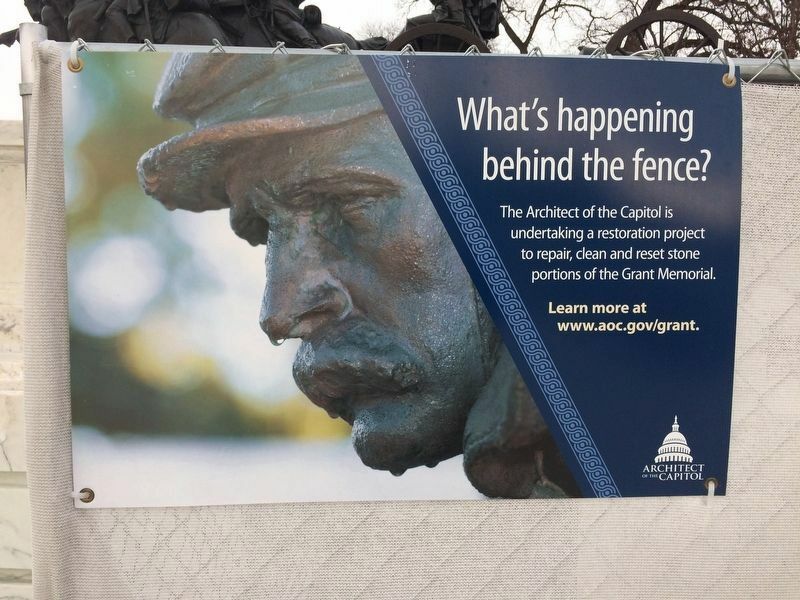 Dedicated on April 27, 1922, the centennial of Grant’s birth, the memorial blends the work of sculptor Henry Merwin Shrady and architect Edward Pearce Casey, the son of the engineer who completed the Washington Monument. Shrady, self-taught and relatively unknown, won the memorial competition and devoted the final twenty years of his life to the project. Tragically, he died just fifteen days before the dedication, but not before capturing his own likeness within the cavalry grouping as the face of a fallen trooper. The Grant Memorial in Washington by The Grant Memorial Commission, 1924). Erected 2009 by National Mall and Memorial Parks - National Park Service, Department of the Interior. Location. Marker has been reported missing. 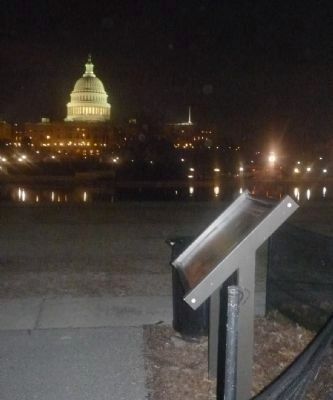 It was located near 38° 53.319′ N, 77° 0.863′ W. Marker was in The National Mall, District of Columbia, in Washington. Marker was on 3rd Street, SW just north of Maryland Avenue, SW, on the right when traveling north. Touch for map. Marker is in Union Square at the east end of the Mall, in the grass off the walkway near the southwest corner of the Capitol Reflecting Pool. It is north of Maryland Avenue (open to vehicles with government permits, only) and east of the 3rd St. and Jefferson Dr. intersection. Marker was in this post office area: Washington DC 20004, United States of America. Touch for directions. (about 400 feet away); Green Roof Engineering (about 400 feet away); Green Roof Plants (about 400 feet away). Touch for a list and map of all markers in The National Mall. Toward the National Mall and the Washington Monument. 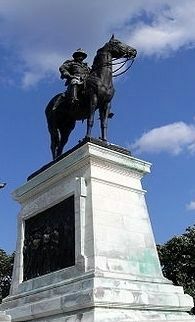 Equestrian statue of Grant: approx. 17 ft. 2 in. x 8 ft. x 4 ft.; Base: approx. 22 1/2 ft. x 6 ft. 4 ft.; Platform: approx. W. 252 ft. D. 71 ft. (10,700 lbs.). by Vermont Marble Company;the figure of Grant, dressed in his military uniform and slouch hat, seated astride his charger, Cincinnatus; Soldiers carrying flags and rifles march in profile. The marker has been removed from this location. 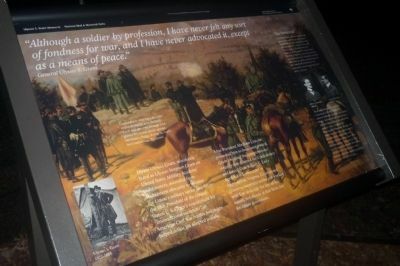 This photo is from the same location as the nighttime photo of the marker. The Grant monument is undergoing restoration. What's happening behind the fence? 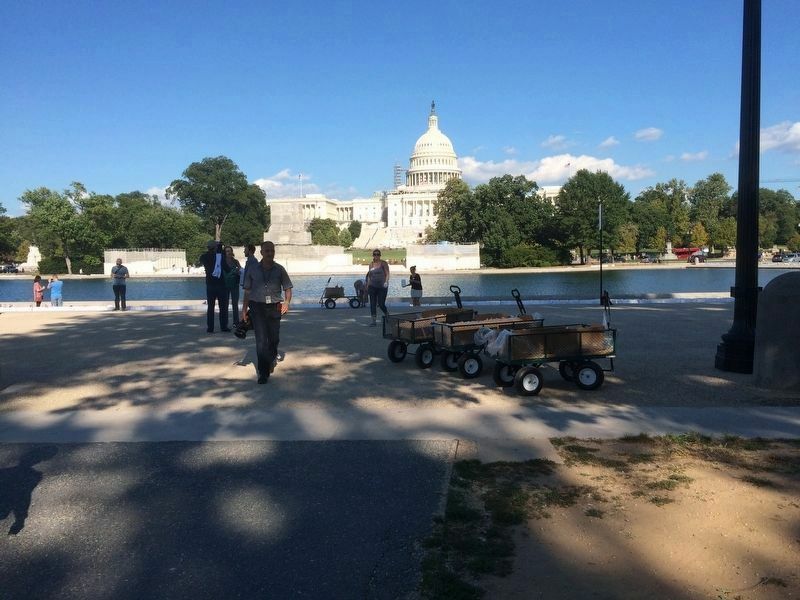 The Architect of the Capitol is undertaking a restoration project to repair, clean and reset stone portions of the Grant Memorial. More. Search the internet for Ulysses S. Grant Memorial. Credits. This page was last revised on December 15, 2017. This page originally submitted on January 23, 2010, by Richard E. Miller of Oxon Hill, Maryland. This page has been viewed 1,911 times since then and 9 times this year. Last updated on April 4, 2010, by Richard E. Miller of Oxon Hill, Maryland. Photos: 1, 2, 3, 4. submitted on January 23, 2010, by Richard E. Miller of Oxon Hill, Maryland. 5. submitted on February 25, 2010, by Richard E. Miller of Oxon Hill, Maryland. 6. submitted on January 23, 2010, by Mike Stroud of Bluffton, South Carolina. 7. submitted on September 13, 2016, by J. Makali Bruton of Querétaro, Mexico. 8. submitted on December 12, 2017, by Devry Becker Jones of Washington, District of Columbia. • Craig Swain was the editor who published this page.